I cannot believe I missed May Day on here. I am so disappointed in myself! Bah! When I think of May Day, I think of little woven paper baskets, with pitiful but playful little pansies, picked and semi wilted. My sisters and I would rush up to the doors of neighbors and drop them on the porch and knock and flee! Fun! I miss that! I've been putting off buying annuals this year, until the freeze is over. That may not be until July 5th. Right? Guess what I bought? I can't believe I was a sucker and fell for this. As if.. But, I bought some Hawaiian flowers! You know... what are they called? The ones you smell all over in Hawaii? Ummm... Plumeria! I bought them on QVC. I got suckered in! To think that especially on the coast, that I could grow these. Well? Shows that I am a forever dreamer! An optimist! Or- just "plum" crazy! They come in the form of branches that you stick in the ground. Then, you pray! It says if you live in cooler climates, they may not bloom the first year. I know what will happen to mine! Root Rot! No... I'm going to do it! They will grow! You'll see! I have them in my little greenhouse on the top shelf! They WILL grow! Anyhow, Happy May Day! Even though I missed it! 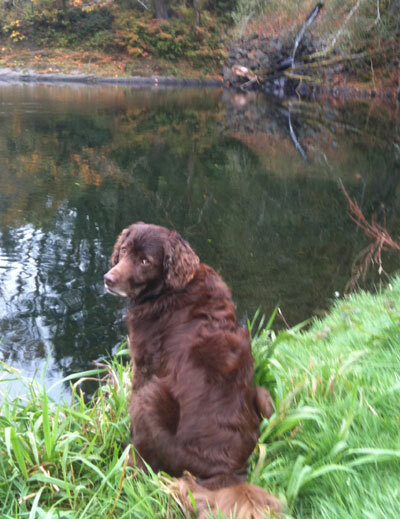 Yesterday Bill and I went for the first "shake down" on Tillamook Bay for springers. We took both dogs as I can't stand to leave them, when I'm only home for such a short period. They were so wild! The weather was beautiful, but man, it was still so cold! Here's a short clip of Kilchis My Cuteso! Oops... Sorry, it's sideways! Oh! I did catch a cutthroat. I can't believe they'd go after those huge trebles. Oh! Man! Did you see that excellent show on PBS last night, about the salmon fisheries? And the dams? Wow, that was good and so fun to see my fishing heroes! Jim Martin, David Duncan! Whoo hooo! Go, you guys! Someday, I'm going to be on that side of things. I'm going to sit in a park someday, and talk to strangers about saving salmon. I will! You watch! I might be old, but I'll be telling the tale of all that I've learned! I think it's going to be a colorful day on the discussion board, due to the death of Bin Laden. Did you know he had marfan syndrome, or so they say? Wow. Roo and I are in rotten company! Abraham Lincoln, too! But, at least that association I'm proud of! I've had the most colorful and vivid dreams, lately. Last night, I faced a cougar, again. That was so scary that I woke everyone up, screaming about it! It was just like the time I really did end up face to face with a cougar. That same fear! Well, I'm off, I guess. I've so enjoyed having a weekend off from radiation. Now, it's time to get back on schedule and look forward to the next one! Soon... very soon, I'll be posting pictures of fish, instead of just the process of fishing! Please hang on! The board was hacked, and vbulletin is being hacked, globally. We are working on it! BD looks to have gotten it, and lots of info on it, here. What a mess, last night! Looks like everything is gradually taking place correctly, again. Why do folks do those hacks? Argh.. I'll tell ya all more, as we get things in order. Man, that was some night. So many, many vbulletins affected and the poor people going crazy, trying to fix, or figure out. Pheh! I still have a headache! I'm so sorry that some of you don't think I'm updating my column. I don't know what is going on, but unless you clear your cache and then reload the home page on ifish, my columns don't appear to be updated. Weird, huh? But, I am writing! I am! Thing is, the coding has changed and all I'm in charge of is the column, so I can't fix it. I have five more radiation treatments and then 8 "boosts". The entire area of where I'm getting radiated is bright red and burned. Ouch! Little blisters all over it. This whole thing is no fun, but it is do-able. It's like you have to just take a year off and do what you have to do. Can't wait to get back to fishing and doing what I love. Today I'm going to go buy some annuals and plant my flower baskets. I can't wait! I already have some lettuce growing in little containers. I can't wait to have fresh salad! I think we'll go fishing on Mother's Day. What would be better than that? I know! French breakfast puffs on the boat! Better get the boys busy making those! If you want the recipe, it's here. (See May 4th) I have the best memories of French Breakfast puffs as a kid. Oh, they are yummy! Funny that I should think of these again, at the same time of year! Yum. Oh! Have you been to Panera Bread? Their cinnamon chip scones taste very similar! So good! Thanks to my sister in law, Patty for hunting those out for me! Oh, man they are good! I've been watching the redds, daily. I love having them around to spy on! Funny that the steelhead have their redd area, and the Fall salmon are further upstream, each year. Same thing, every year. Oh, man!! It's like grade school all over again with some people. I have been getting nasty grams from a guy on ifish who had been banned. He most recently showed up as "Slick" but he has a bunch of others. It's kind of fun to sit back and watch him, as if he thinks he's sneaky. Just real simply, I would like to ask a question. If he doesn't like ifish, why does he keep reregistering? If ifish isn't the best, then why does he come back? He sent me the nastiest letters! I just had to giggle. Do some folks never grow up? Please be careful who you are talking to on the internet, because unless you have access to IP addies, you just never can tell who they really are. Why the obsession to start an "I hate ifish" web site and post several posts about how much they dislike it and me, every day? 10 years after the initial problem, these folks are still daily reading every post on ifish and seething about it. The only thing I can think of is that they are trying to get others to not come here? But, it seems to be backfiring on them..
You know, when I don't like something, I don't "go there". You know? I move on. Sigh.. I guess I'll never understand. And it's not about who is right and who is wrong. We make mistakes here at ifish, too. Yep. We do! Bill said that not many organizations are so "popular" that they have an "I hate" club, and that I should actually be proud. I had a journalist asking for me to sell my story regarding ifish. If it helps others, then I will. Oh, do I have a story to tell! Well, enough of this... I'm off to plant some flowers and have some fun. So tired with this radiation stuff that I'm moving in a slog, but I'll slog my way to a garden of beauty! Happy Mother's Day, tomorrow! We all deserve a bright, fresh springer! Happy Mother's Day, though, to all of you out there, carrying on, being the best Mother's we can be! It's not easy, but it sure does bring blessings! I'm sitting here, surrounded by beautiful goldfinch! You should see! They are so gorgeous! It's funny, though. I have an entire feeder full of (expensive!) thistle, but they prefer the sunflower seed feeder! They have every dock covered! Man, they are hungry!! It's full season on song birds, right now. We have grosbeak, purple finch, gold finch, song sparrows, white crowned, golden crowned, junco (a few, still...) and chickadees! Did I miss anyone? It's like trying to name off the moderators! I'm going to relax, today. We were going to go fishing, but as usual, we lazed out on that idea. It's just too cold and nasty for me. I'm a breast cancer fair weather fisher girl, this year. But, you wait! I'll be back, and tougher than ever, next year! So, I wish to all of you the most awesome Mother's Day you have ever had! I saw a guy in the store, yesterday, with a jewelry bag in his hand. I said, "Oh! Someone is going to be happy! What is it?!" "Diamond earrings" he said, with a wink. "What a great gift! Will she be surprised?" "No, she picked them out!" This morning, I was surprised with my annual fuscia plant! It is so gorgeous! Thank you, Bill! You are the best!!! Give flowers to the living! That's how I feel! And give LIVE flowers to the living! Off I go to take a hot bath. Then, I'd like to consume mass qualities of blueberry pancakes! Yum! I had a great day, yesterday! Do you ever feel like you just spin your wheels trying to do good things, but it doesn't do the good you intend it to do? I do! All I can do is to keep trying. Keep my chin up, and try, try again! I need an attitude adjustment. A latte! That will do it! Right?! It's been a tough week, but I'm ready to make it better! I am on furlough. :) My skin is pretty badly burned from radiation, so they made me take two extra days off. (The weekend, plus two days!) So, I have four days to heal before we plan phase two "attack" on those nasty cancer cells, again! I am just so thankful that my prayers keep getting answered. I honestly don't know how people do it... life, that is, without our Heavenly Father. I woke this morning to sunshine and goldfinch! While I was gone this last time, the Kilchis River Valley exploded in grosbeaks! They are everywhere! We also have a large flock of goldfinch, so everything is colorful and lively! I planted a bunch of flower baskets to go along and they look gorgeous together! Only thing that is missing, or rare, is hummingbirds. Where are they? I miss my hummers! I'm going out this morning to check on my outdoor cam. I love it when I actually forget it for a while. I guess the key term is "letting it soak". That's funny, to me! Anyhow, I've let it soak for a grand total of four days. I bet I'll have some deer pics! Funny that my sister in Wilsonville has deer problems so badly that she uses all kinds of things on her roses to keep them away, and yet me, living way out here in the forest... I get excited when I see them! Seems backwards! Bill went out fishing with Dudley and Jack while I was getting doctored. They caught two nice fish, but they both had too many fins. I'm hoping to go out tomorrow. Yes. In the sunshine! All wrapped up in a blanket! It's so cold out there, still! Still no springer fishing for me... I'm really not supposed to, but I long to. I ache to! All those kinds of words! My soul yearns for fresh scales from the ocean! But, every time I lift my arm, my skin separates, where it's burned, so it's not a good idea! But, what's more important? My skin or my soul? Tough one to decide! My life is so upside down, lately. Thank God for the moderators who are doing all the work, lately! I can sleep like never before. Hours on end, if I'm able! I'm plenty content to lay in bed with a good book or the remote control tuned to HGTV. I'm hooked on that first time buyers show, trying to learn all the new things there are to learn! I want to know all of the first time buyers dumb mistakes! I want to avoid them, but I'm afraid I've already racked up the highest score! My real estate person is my sister in law, and it's so embarrassing for people in my family to know what a "newbie" I am! The other day we found a good deal on a place in Beaverton and I really liked it. She turned to me (we only saw the house once!) and said, "Let's do it! Do you want to put an offer in?" WHAT? I'm buying a house? For real? Well, yeah... since she'd spent hours upon end showing me homes, I suppose she was with the understanding that I was buying a home! LOL. It hit me like a ton of bricks, though. So scary! Am I going to sign the offer? I still don't know! I'm scared to death! The boys then, would have a place to stay so that they'd be in a better job market, I'd have a place to stay while I am under medical care, and well? It all makes sense. It all adds up. So, why am I so afraid? And- Oh no! Bill is hooking up the boat! He's going fishing, even if I don't! I think I will take the plunge! I think I'm going fishing! Even if I just sit there, it will be good for my soul, right? As for the home? I'm getting closer to signing on the dotted line. It's just so darn scary! I think when I finally do it, I'm going to yell, "FISH ON!" We got down to Memaloose, and hardly anyone was fishing. We are all ready, everything packed, everything good. Plug is in, and... argh. We had been dragging the electrical for the lights the whole way and part of the brake system had popped off. Without that, we can't back the boat. The brakes lock up. Pheh! So, off to the auto parts. They have none, so we order it, then go over to Subway, order some biscuits and gravy to go, and head home. Food is so good when dealing with disappointment! There is a leak in my down comforter! I wake to feel the chill of the damp air creeping in. My eyes beg to stay closed. My body, to remain still and warm in this blessed cocoon. My senses want to stay at rest, but there is mounting excitement and activity on this Spring day! My soul is too excited to stay still with all that is happening. The rich aroma of my very last batch of Costa Rican coffee is dancing its way up the stairs. It is in loud contrast to being barely awake in this house-as quiet as a mouse! My eyes awake and my ears open! A melodic bird symphony sings right thru my open window. Even the songs sung in minor intervals ring happy! My early morning heart is light and trouble free! The morning's hush-and-lush matches the intensity of the smell of coffee. It now fills the air, thick and rich, dark and damp. It has come to find me! To ferret me out! To fetch me out of bed, my lazy-dazy head! Clean wood floors greet my bare feet. Feels good. Feels wholesome. Feels right. I open the door and a full blast of Spring hits me in the face. Happy, early morning dogs waggle at my feet, their soft fur rubbing against my bare legs. They scramble to be first to go outside. We all giggle (silently- in our hearts!) as they race around me. I know it's a good day when not one dog tonenail punctures my bare feet on this very good and perfect morning! I pause against the door frame to take it all in. I drink deep, and let the damp air fill my mouth, my nose, my eyes. A million tomorrows shall all pass away.. The air creeps under my robe and gives me a chill. I bundle against it, and softly close the door to a sky full of bursting cherry tree blossoms. I'll get back to you, later! The cat rubs against my leg, leading me to the treat bowl. Who is more treated? The one receiving the food, or the one who receives the cat's blessing? Spring mornings are a part of what I think Heaven must be all about. His friendship, His closeness, His Joy! This is my Father's World and I am so thankful! Woke up to magic, again! This morning it's that Spring fog ithat greeted me. Wait a minute? Spring "fog"? Do we have Spring fog? We do this morning! I have two more weeks of radiation, now. Man, did I ever enjoy my time off! I'm having a bugger of a problem trying to figure out why this front page isn't auto refreshing like I had it, before. I had it on meta refresh every 500 seconds, but now it won't refresh unless I clear my cache. Argh. There is a thread, here. Did I mention that they had to give me two days off in addition to the weekend, to heal the bad spots? It seems that I feel really good after a huge night's sleep and then totally expire, sometime mid afternoon. Then, I'm just happy to stay in bed and read or watch TV. My body feels OK, just so, so tired! Well, I need to get through my mail and work, and onto my travels. I'm excited to watch my bulbs come up. My lettuce is about four inches tall and wanting to get into the real earth, instead of their little baby boxes. Happy Fishing to all of you out there! I'll get you next time! Spring is getting better each day! Phooey with July 5th! I'll take today! I have to get in the shower and off to radiation. I'm so hopeful that my skin is alright to go thru the whole week. Otherwise they keep pinning on extra days to the end of the schedule. It's kind of like school snow days. They are great at the time, but then I have to go to radiation longer, in the end. Ken, (Papahog on ifish) just sent me this and man, oh man... did it ever get to me! Whooo hoooo! Well, I'm off to the road. I have a feeling that the sun is going to shine just a little brighter, today! Sometimes, in the coastal evening chill, when my tummy is full of good food and family cheer, I have a longing for a little quiet time. Already in my loose cotton sweats, I grab a fuzzy blanket. No longer are such things as quilts and handmade blankets treasured in our society, it seems. Now, it's that soft fiber, spun from a pop bottle, (or some such petroleum product! ), and woven into an incredibly warm and most cozy-comfortable throw. I have to admit both my sadness over the loss of art, and the seduction that pulls me into the purchase! So, I grab one of those... things, and cuddle up to it, clear to the tips of my ears, throw a pair of rubber boots over my woolen socks, and head out to the river, before dark. It's at that time that the swallows swoop over the river, gobbling insects before they land on the water and are eaten by trouts. It's at this time, that the river otters come out to play. First, invisible to the eye, but once discovered, create quite a ruckus on the river bank, and have me giggling, in no time. They are the most fun characters! They enjoy life! They must! Oh! My ears are frozen! I just got back. The otters were too far away to watch the show. Should have taken the opera glasses! Put up a couple Youtubes of what it's like out there, at night. They are here. Oh, and now a hot bath and cool, clean sheets for the night! I'm not even going to say we are going springer fishing in the morning, because that just seems to jinx the trips. So... Good night! It seems wetter and colder, each year I get older. Wow. I'm a poet. But, is it just me? And does life just continuously get busier as you get age? I keep having to "quit" things, in order to have enough time to keep my sanity. Is that normal? I want to ask one of you older people. Is that normal? I always thought older people had time to knit and do things like that. Why don't I have time to knit? I don't even remember how to knit, let alone have time to try it! I was thinking it would be fun to have a macrame vest for an outfit I have. I thought I could make it myself... if I had time! But, instead, I think I'll go search the GoodWill. That is, if I have time! I can't wait till my radiation is over! I have two more days! Whoo hooo! Then, I'm done! Cured! Branded a survivor! That's funny, though, because the moment you are diagnosed, you are called a survivor if you are still alive! Why is that? ...full of questions and curiosity, today. You know, I don't have enough money to buy a house that I would like to live in. After looking at my finances, and looking at a million houses in the category that I could afford, I have sadly realized that darnit, anyhow. I don't like what I can afford. Row houses, for Pete's sake! Or, fixer uppers, or a condo with no place for Kilchis to run. However, if I moved to Costa Rica, or Nicaragua, or some sunny beach, somewhere, I find I can afford a hut on the beach with a gorgeous view and fishing, right in front of me!!! I spend time dreaming of travels! I google tropical islands, and listen to my sister tell me of days on a sunny beach in the Caribbean, or crabbait, talking about his mornings on his sunny deck, with his beautiful daughter, sipping rich coffee and drinking fresh squeezed juices! With sunshine on my shoulders! Morning-- Woke up at 4:30 and said, "Bill! Bill! I can't go back to sleep. Let's go fishing!" Of course, he was up for it! So, we are off, really soon. Just thought I'd peek in, while gulping my coffee to tell you that! I am all done with radiation, and I'm free! I'm cured! I'm all better! I'm all done! So, with that good news, I'm going fishing! I'll tweet (ifishjennie) or facebook (Jennie Logsdon-Martin) if I get one! Summertime in Oregon is when it doesn't rain... as much! Got up this morning expecting pouring down rain, as the forecast predicted, and it was only drizzling. Want to go where it is sunny and warm? Sick of all this rain? Move to Alaska! It's like some retirement villa over there in Fairbanks. The temperatures are in the 70s and even 80's! Is that not crazy? Move to Alaska! Visions of icebergs and frozen lands fill my mind, but if you'll follow the newspaper, it looks to be darn tropical over there! And it's not raining, either! This is the wettest year that I ever remember. The weird part is that last year, I thought that, too. But, this is far wetter than last year! I don't give up. I keep longing for sunshine. Those pleasant mornings where I can sit on the deck and drink coffee with the sunshine on my legs. Oh, please! Just one day of sunshine? Yep. Oregon is where it doesn't rain as much in the summer. It rains, daily. But, not like in Hawaii. Noooo, not that kind of warm rain. It's cold, and it's wet! I wore a sweater and a sweatshirt, yesterday! And it's almost June! And... I wake to just a slight drizzle, and perfectly fishable weather. On the up side, I reserved a beautiful place for Ruth and I to stay when we go to ICAST, this year. I splurged and reserved a really nice room at the Cosmopolitan, right on the strip! This will be SO fun! It made me giggle, when I hit "Book this reservation!" I spent numerous days shopping for a good deal, and this year, I just couldn't find one, so I gave in, and just splurged! We have a room with a balcony overlooking the Bellagio! Yay! The Bellagio "Lake of Dreams" makes me cry, every time I see it, so this whole week, will I be in tears? I think so! It gives me the sup sups! I think a week in July in Las Vegas will also cure me of the need for sunshine! It's so blasted hot, there in July, that I'll be glad to come home to the drizzle. Right? I hope so! Soon... I will be celebrating the end of my cancer treatment, sitting in the sunshine in Vegas. where the sunhine kisses my shoulders!"